Trina Peterson: Holy Best Retreat EVER, Batman!! Holy Best Retreat EVER, Batman!! Sew South Retreat 2013 = one of the greatest experiences of my life. Last weekend I was one of 50 fortunate and fabulous women who attended the first ever Sew South Retreat in Charlotte, North Carolina. 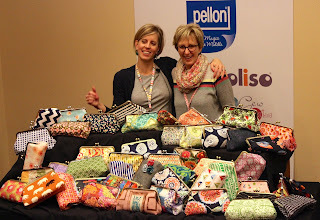 Sew South was founded by Jennifer Mathis of Ellison Lane Quilts. The retreat began on Thursday, March 21st at 10am. Several ladies attended the optional Fabric Field Trip to a lovely local quilt shop, We're Sew Creative, where we found some beautiful, high quality fabrics and quilting notions. The staff at We're Sew Creative was extremely friendly and accommodating, even after seeing the huge group of us arrive on a charter bus and take over their store! Next on the field trip was a stop at IKEA. May I just say that the pink cream cakes are a little hunk of heaven. Definitely try them if you have the chance. The fabric at IKEA was very unique and a great bargain! I bought 5 yards of a contemporary sketchy fabric. Who knows what I'll do with it? What can I say? I'm a junkie! Thursday evening marked the official kick off for Sew South. At hotel check-in, we were all greeted with a goodie bag put together by Jennifer with gifts from her sponsors. All of the ladies had arrived by 6 pm for our Cocktail Mixer. It was so exhilarating to be in a room full of 50 strangers who all have in common an extreme passion for sewing. Any nervousness or anxiety quickly vanished. Everyone was very welcoming and friendly. We were all excited to begin our projects together! After the mixer, we filed into the ballroom that was to be our spacious workshop for the next 3 days. Everyone picked a spot, and the creativity began. Friday morning brought our first project: paper piecing. Jennifer Mathis, Sew South Creator, shared 2 of her own designs with us and gave great instruction to those of us who were diving into paper piecing for the first time. It was great fun! (even though I had to rip out my block a couple times and try again). My sewing neighbor, Holli from San Diego, quickly took me under her wing and helped me along the way with every project. She had a few very helpful tricks and was very patient. My roommate from Georgia, Cindy, also patiently answered my questions and encouraged me though all the projects. We also had fun chatting until the wee hours of the morning about our passion for sewing, our families, and life. Friday afternoon brought with it the beginning of our big project: the dreaded Duffel. Lindsay Rhodes, from LRstitched.com taught the Duffel class and stuck with all 50 of us and guided us through to completion. For most of us, this was an ongoing project that took until Saturday to finish. (I think it was almost midnight on Saturday when I FINALLY finished.) An impromptu tradition began early in the Duffel game. Every time someone finished their masterpiece (the Duffel), they would stand and showcase their bag. The room would erupt in cheers and clapping to commemorate the accomplishment. The intangibles like enthusiastic encouragement and the generosity of shared knowledge gave Sew South an extra level of fun and value that cannot be measured. Saturday morning was very special for Diane Stanley of randomthoughtsdoordi.com. It was her first time teaching a class! She brought us a great pattern for metal-framed clutch purses, and did a fabulous job teaching the class. It was so fun to make these clutches and even more fun to see it done in 50 unique and beautiful designs. Saturday afternoon was our pajama pants class. Jennifer Roycroft from We're Sew Creative came by to take us through our last project. Some of the retreaters did not have much experience with garments. This was a fun and quick project. 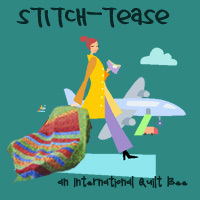 Many of us commented before departure about how we enjoyed the variety of our projects at Sew South. It wasn't all quilting or all garments. It was a little bit of everything. Sunday morning was our closing ceremony in a way. Jennifer made a video for us to see with pictures from the weekend. There was many a tear shed when we went around the room saying what we loved about Sew South. For many of us, it was the friendships forged. It's amazing how powerful some attachments can become in such a short period of time. 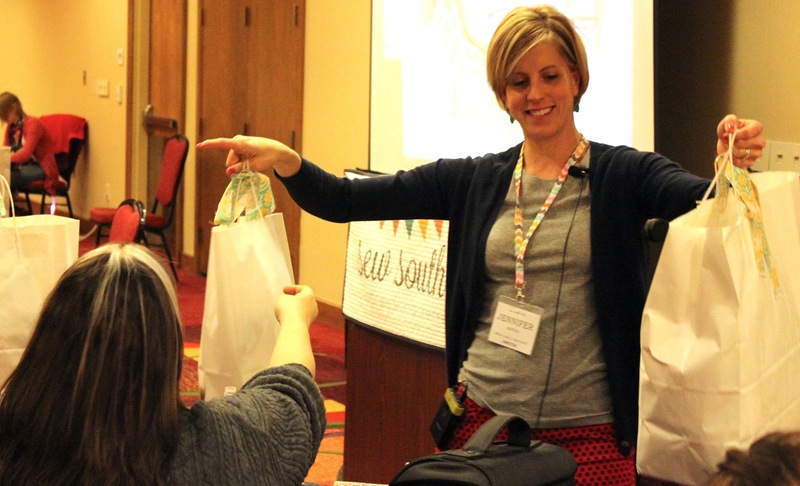 We were all very grateful to be a part of something as wonderful, educational, and inspiring as Sew South Retreat. Just before we were all about to pile our sewing machines, fabric, completed projects, and goodies into our cars and head home, Jennifer surprised us with an over-the-top Oprah-style giveaway! Her husband rolled into the ballroom with carts full of gift bags that contained mounds of awesome sewing supplies, patterns, fabric, books, samples, etc. The tears kept right on rolling! Everyone was so shocked and excited about everything Jennifer had done for us. It was like Christmas! Except better! - because we never get gifts this awesome from our families who don't understand our fabric fetish! Many of us exclaimed that we were ready to buy our ticket for next year! When I finally pulled out of the parking lot to head west for 950 miles, my Jetta Sportwagen loaded down with loot, I had butterflies in my tummy and a warm feeling in my soul. Sew South has altered me. I am inspired. I feel that there aren't enough hours in the day, days in the week, weeks in the year to create all that I want. I guess I'll just have to take it one piece of fabric at a time - and count down the days until the next Sew South Retreat! All of my loot from Sew South. Thank you sponsors!! Would like to see your finished projects from Sew South. Why not put some photos on this site. Great recap. Can't wait to do it all again! it was so nice to meet you. I hope we meet again! I was so glad that you got a ticket at the last minute. And can't wait till next year either!